“Although I devoted most of my professional life to the study of the persecution of the Jews, that has never been what has driven me as a Jew. I value and celebrate my tradition and its teachings. My awareness of the many wrongs that have been perpetuated against the Jews throughout history is not the foundation of my Jewish identity. Jewish culture and Jewish history constitute the foundation of who I am”. With this statement from her concluding pages, Deborah Lipstadt summarizes her sharp, courageous view of antisemitism and her fight against the victimization of Jews. Antisemitism: Here and Now awakens the audiences to the multipronged nature of the threat, combining insightful theorization with real examples of antisemitic attitudes and behaviors from contemporary social and political arenas. The complexity of the topic and the multitude of insights that the author provides make it impossible for us to address all of them. The book is organized as a series of letters to two fictional people with whom the author has become “acquainted” at the university where she teaches. One is Abigail, a Jewish student who is trying to understand the phenomenon of antisemitism. The other one is Joe, a colleague who teaches at the university’s law school. A non-Jew, he has a deep appreciation for both the successes and the travails of the Jewish people. Throughout the exchange, the three individuals stimulate each other’s reflection on the many faces of antisemitism, combining passion and academic rigor. The starting point of the work is, inevitably, the attempt to define the subject matter. What the author calls the “unending saga” of antisemitism is hard to explain, as is the case with all conspiracy theories, of which antisemitism is just one. Social scientists have described such theories as having a “self-sealing quality” that makes them immune to challenge; all new evidence is absorbed into the theory, all doubters are in on the plot. Much of the general public cannot define antisemitism and even scholars in the field struggle to settle on a precise definition. The author highlights that in ancient and medieval times, antisemitism was religious in nature. Jews were hated because they refused to accept Christianity and, later, Islam. In the Eighteenth century, radical and political rationales were added to the religious one. By the nineteenth century, those on the political right were accusing all Jews of being socialists, Communists, and revolutionaries. Those on the political left were accusing Jews of being wealth-obsessed capitalists who were opposed to bettering the social and economic conditions of the poor and working classes. Further complicating the matter, the pseudoscience of the eugenics posited that Jews were inferior in their genetic makeup. Lipstadt notes that, just as Jews were endured accusation of being the predatory capitalists and subversive Communists, so the eugenicists simultaneously argued that Jews had superior traits as well. They were maliciously intelligent, so the theory went, and, because they were able to easily mix with non-Jews, used those traits to wreak havoc with non-Jews’ lives. Contradiction presents no problem for the antisemite. Deborah Lipstadt reminds us that antisemitism is not limited to one educational class: intellectuals have believed in antisemitism as surely have the uneducated. Sometimes antisemitism presents as an irrational belief, and sometimes as a coherent doctrine. This is part of what author believes is its “elastic” quality. Sometimes it is a passion, and in other instances seems normative. The author chooses the former because the right side of the hyphenated word can stand alone. There is no such a thing as “Semitic” people. The word “Semitic” was coined in 1781 by a German historian to describe a group of languages that originated in the Middle East and include Arabic, Hebrew, Aramaic, Amharic, ancient Akkadian, and Ugaritic. There is nothing that binds the speakers of these languages together as a people. For some reason, when the word first appeared in English in 1893 it was given a hyphen. In French and Spanish, the word has always appeared without the hyphen (and all lowercased), and this makes sense since it means, quite simply, the hatred of Jews. It does not mean antagonism toward a non-existent thing called “Semitism”. In the following chapters, the book contains a sort of taxonomy of the antisemite. It is an exhaustive list of profiles and behaviors that range from the more vocal extremist whose ideals based on “blood and soil” — a German slogan (Blut und Boden) that was central to Nazi ideology — to many other, more complex kinds of antisemite. Within or better — next to — the taxonomy is an interesting category: that of the antisemitic enablers. Deborah Lipstadt explains this notion using two distinct examples: Donald Trump and Jeremy Corbyn. In the case of Trump, antisemitism does not seem to be rooted in any ideological foundation. On the contrary, it serves political purposes. “Is there anyone in this room who doesn’t renegotiate deals? Probably 95% of you do renegotiate. I am a negotiator, like you folks. But you are not going to support me because I don’t want your money. You want to control your own politicians”. According to the author of Antisemitism, in those few sentences, Trump hit almost every millennial-old antisemitic stereotype: Jews have an unnatural desire for money, power, control, and haggling, and an innate deviousness (negotiating a deal after it is made). Also, Trump refused to seriously address the antisemitic behavior of some of his supporters. For instance, David Duke, former Ku Klux Klan leader and Holocaust denier endorsed Trump’s candidacy. Trump insisted he could not condemn Duke because he knew nothing about either Duke or the Klan. He said this despite the fact that ten years earlier he had labelled Duke “a bigot, a racist, a problem”. According to the author, Trump’s response in the summer 2017 to the terrible event in Charlottesville, Virginia, was even more troubling. Indeed, Trump condemned the egregious display of hatred, bigotry, and violence on many sides. Two days later, in an apparent effort to walk back his absurd statement, Trump read a statement condemning those who came to Charlottesville to cause violence, “including the KKK, neo-Nazis, white supremacists, and other hate groups”. After that, however, he said that there were “very fine people” marching with the white supremacists. Obviously, Trump has not created these white supremacist groups or the sentiments to which they adhere, but he has let these reprehensible genies have more space than they did before. On the other side of the political spectrum we find British politician Jeremy Corbyn. His record in politics is more extensive than Trump’s and more deeply rooted in firmly held ideological beliefs. Corbyn has been part of Britain’s labor and trade-union movement since the beginning of his career. In the 1970s he worked as a trade-union organizer and was active in the antiapartheid movement in South Africa. He showed great sympathy for the Irish Republican Army. Corbyn became the unexpected head of the Labour party in 2015. Anyone white, wealthy, or associated with a group that seems to be “privileged” cannot be a victim to Corbyn. Lipstadt is intellectually honest enough to admit that Corbyn does not deliberately seek out antisemites to associate with and to support. Nevertheless, it seems that when he encounters them, their Jew-hatred is irrelevant as long as their other positions — on class, race, capitalism, the role of the state, and Israel/Palestine — are to his liking. In particular, Corbyn has come to the defense of questionable personalities. One month after 9/11, Raed Salah, a Palestinian Islamist preacher, contended that American Jews working in cahoots with Israel planned and carried out the attacks as a means of “diverting the attention of the media” away from Israeli wrongs and directing sympathy towards the Americans. When the British Home Office announced that it was denying Salah permission to enter the UK, Corbyn protested, declaring him an “honored citizen” and publicly inviting him to Parliament. Corbyn also worked with Dyab Abou Jahjah, an Arab political activist who, two months after 9/11, described his sense of “sweet revenge” as he watched the attacks. 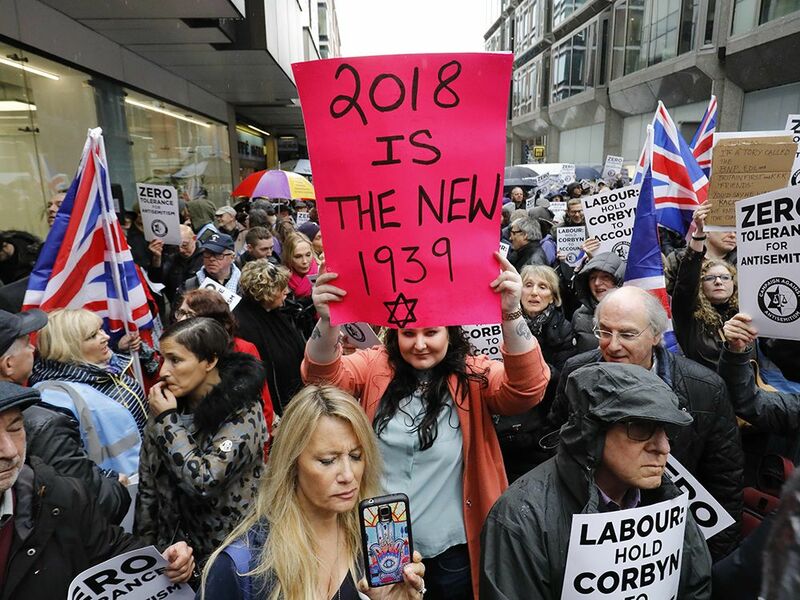 In 2006, Jahjah described the “cult of the Holocaust and Jew-worshipping” as Europe’s “alternative religion”, and Corbyn subsequently invited him to speak at a London antiwar rally. A few years later, Corbyn claimed ignorance and said he could not remember ever having worked with Jahjah. Based on this, the author states that Donald Trump and Jeremy Corbyn are not themselves antisemites, but they have often facilitated, amplified, and emboldened expressions of antisemitism. Two of the most provocative categories included in the taxonomy are the “dinner party antisemite” and the “clueless antisemite”. Most likely, the former has Jewish business associates, perhaps even a Jewish friend or two. But he will be the first opponent of a new synagogue, because “let’s consider the long-term ramifications, in terms of population balance.” Lipstadt notices that if you make bigoted statements about Jews, you are antisemitic, regardless of how many Jews you are related to. Calling a prejudice “polite” does not in any way lessen its significance. The clueless antisemite is an otherwise nice and well-meaning person who is completely unaware that she has internalized antisemitic stereotypes and is perpetuating them. Following the taxonomy, the author contextualizes many of the most important issues related to antisemitism, ranging from the relationship between antisemitism and racism to the Holocaust denial. Lipstadt notices that, within the complex relationship between Jews-hatred and racism, there is a widespread belief especially among underprivileged minorities who have the assumption that Jews are members of the elite and therefore cannot be victims of discrimination. While there is no point in playing the “my discrimination is worse than your discrimination” game, the author warns that the belief that an act of discrimination occurs only if a powerful, privileged Goliath is either literally or figuratively beating up on a David who is a member of a racial or ethnic minority is dangerous and misleading. Another remarkably dangerous issue is the so-called “Yes, but” narrative, which tries to rationalize evil. Antisemitism shows similar traits: “Yes, antisemitic speech and violence are wrong. But how can you expect Muslims to feel and to act when Israel takes actions that oppress Palestinians?” There are ways of disagreeing with the policies of the Israeli government without being antisemitic, or amplifying its tropes. As far as the Holocaust denial is concerned, Lipstadt admits that initially she was struck by the complete lack of logic of this phenomenon and dismissed the Holocaust deniers. Later, she learned to confront deniers’ lies and to highlight that denial is not about history, it is about discrediting and demonizing Jews. Also, perpetrators may have said that they were forced to kill, but not one asserted that the killing did not happen. A further dangerous trend around the Holocaust is the “soft-core denial”, which is often taking place on a national level. In Poland, for instance, the nationalist Law and Justice Party (PiS) has attempted to rewrite the history of Poland’s World War II record. Any person or institution that casts aspersions on Poland’s wartime record of battling the Nazis is attacked. Museum curators who have tried to present an accurate portrait of Poland’s behavior during the war have been fired. The situation escalated in the winter of 2018 when, after extended deliberation, both houses of the Polish Parliament adopted legislation that made it a crime to publicly claim that the Polish nation bears any responsibility for crimes committed by the Third Reich during the Holocaust. There were Poles who helped Jews during the war, and more than 6,700 of them have been recognized as Righteous Among the Nations by the Yad Vashem museum of Jerusalem. But there were also Poles — probably many more — who betrayed Jews. And there were Poles who murdered Jews on their own, without any instigation by the Germans. The author does not hesitate to state that Poles who collaborated with the Nazis did so, by and large, for either antisemitic or financial reasons. This judgment is perhaps a little harsh since Poland was an occupied country whose citizens were also subject to mass-murder as “racial inferiors”. Many Poles collaborated to varying degrees with the Nazis to try to save their own family’s lives. It is a rare moment of quite shallow analysis in an otherwise deep book. In Hungary, there has been a consistent effort by the government of Prime Minister Viktor Orban to diminish, if not deny, the role of Hungarians in the murder of the Jews during the war. As Germany’s wartime ally, Hungary prosecuted its Jews severely but resisted German attempts to deport them. In 1944, however, the German army invaded Hungary and deportations started. In approximately six weeks, more than half a million Hungarian Jews were deported to Auschwitz-Bikenau, where more than 400,000 were murdered. Lipstadt appropriately notes that Western Europe is not immune to this type of historical reconfiguration. On April 9, 2017, Marine Le Pen contended that France bore no responsibility for the notorious Vel d’Hiv roundup of more than 13,000 Jews in July 1942. Jews were held at a stadium near the Eiffel Tower for five days until they were deported to death camps. This roundup was planned by the Gestapo and members of France’s collaborationist government. The establishment of international sanctions against Israel. These are probably the most controversial chapters of them book. The author acknowledges that whereas some of the founders are clearly antisemitic, many of the BDS movement’s supporters are not antisemitic and genuinely believe in peacefully affecting Israel’s policies concerning Palestinians in order to bring about a compromise. More debatable is the author’s opinion of public figures who chose to boycott Israel. In 2009, for instance, the Melbourne International Film Festival scheduled a screening of Looking for Eric, a film by British director Ken Loach. When Loach learned that the Israeli embassy was a sponsor of the festival, he canceled the screening in protest of Israel’s “illegal occupation of Palestinian land, destruction of homes and livelihoods”. In 2012, American author Alice Walker refused to allow a new Hebrew translation of her novel The Color Purple to be published in Israel, “which is guilty of apartheid and persecution of the Palestinian people”. One of the concluding chapters — probably the most intimate and passionate one — is dedicated to overcoming the sense of victimhood that historically seems to characterize the Jewish worldview. She takes a step further, warning that “If antisemitism becomes the sole focus of our concerns, we run the risk of seeing the entire Jewish experience through the eyes of the people who hate Jews”. In his 1948 essay Israel: The Ever-Dying People, the philosopher and historian Simon Rawidowicz addressed this phenomenon of Jewish pessimism explaining that the world makes many images of Israel. But Israel makes only one image of itself: that of being constantly on the verge of ceasing to be, of disappearing. 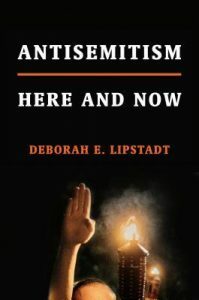 Lipstadt maintains that for Rawidowicz, this Jewish view of itself an “ever-dying” is in fact a psychological coping mechanism, a kind of protective individual and collective emotion. By anticipating the worst, Jews protect themselves from being blindsided by bad turns of events. The downside is that this worldview could become the sum-total of Jews’ identity. Deborah Lipstadt has written an excellent and timely book that combines rigor and passion. As she clearly states, some readers may find themselves agreeing with her at one point and being outraged by what she says at another. This is probably what makes the book interesting, challenging, and definitely worth reading.